WhatsApp Messenger, the popular instant messaging service, owned by Facebook, has announced that it has one billion active users every day. The news comes almost a year and a half, after WhatsApp hit a milestone of one billion users per month. One billion active users per day is much more impressive, and is not entirely surprising to be honest, at least as far as India is concerned. The messaging service supports 60 languages, and the rise in its usage numbers could have been aided by 2 factors. Voice calls, voice messages, video calls on WhatsApp are quite popular nowadays. The majority of people now rely on WhatsApp and similar services, instead of SMS messages, and even for calls. While there is no information on the number of users per region, we think that the other factor, which may have played a major role in our Country, is almost certainly Jio. Reliance Jio has been around for about a year now, and had been offering Free data for about 6 months, in which the number of new WhatsApp users must have been quite high. 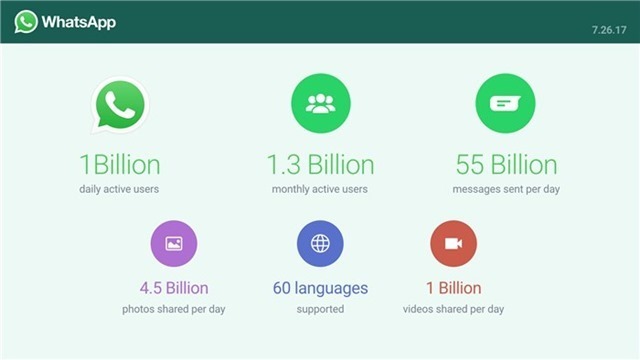 Breaking down the numbers, WhatsApp says it has one billion active users daily, and 1.3 billion monthly active users. 55 billion messages are sent per day, and around 4.5 billion photos, and 1 billion videos are shared everyday. Amazon Prime day, huge discount sale oh their birthday. Telegram Cossed 100 million active users.